Costa Rica All Inclusive Vacations and Packages - Travel Made Simple! Picture this: you are sunbathing next to a luxurious pool and jacuzzi at one of Costa Rica’s finest high-end all-inclusive resorts, sipping a cocktail after a relaxing morning at the spa and a lunch of fresh seafood. Or maybe you are lounging on a white sand beach just feet away from your beach front hotel room while the kids are out of your hair enjoying the all-inclusive kids’ club and unlimited snacks. Or perhaps you prefer the serenity of an adults-only resort? Welcome to your all-inclusive vacation in Costa Rica! All-inclusive resorts are a great place to spend your Costa Rica vacation. You can enjoy both the Pacific coast or Caribbean coast in luxury and every volcano or cloud forest in-between. You never need to leave your hotel because everything is included. Drinks, from soft drinks for the kids to alcoholic beverages for the adults are at the tips of your fingers all day. You’ll love the included breakfast, lunch and dinner at one of the various restaurants right on the hotel property during your entire stay. Never once worry about meals. Everyone in the family will adore all the amenities included, including specialty resort spas and spa treatments, high-end dining, free wi-fi, swimming pools, fitness center, water aerobics, nightly entertainment, daily activities and the all the snacks, premium spirits, cocktails or glasses of wine you can enjoy. Gratuities are optional, as tipping is not as common in Costa Rica (although they are appreciated for exceptional service!). Are you looking forward to your Costa Rica All Inclusive Vacation? Most of our all inclusive vacation packages are located in the country’s northern province of Guanacaste Costa Rica. There are also some all inclusive resorts in the central Pacific coastline of Costa Rica and some also include destinations like Cahuita, Tortuguero and Puerto Viejo. The international airport in Liberia (LIR) is located within an hour from many of Costa Rica’s finest all-inclusive resorts. This allows for easy overseas travel! Many of the country’s all-inclusive resorts offer daily activities and adventure tours. Try scuba diving and other water sports one day and zip lining and hiking the next! 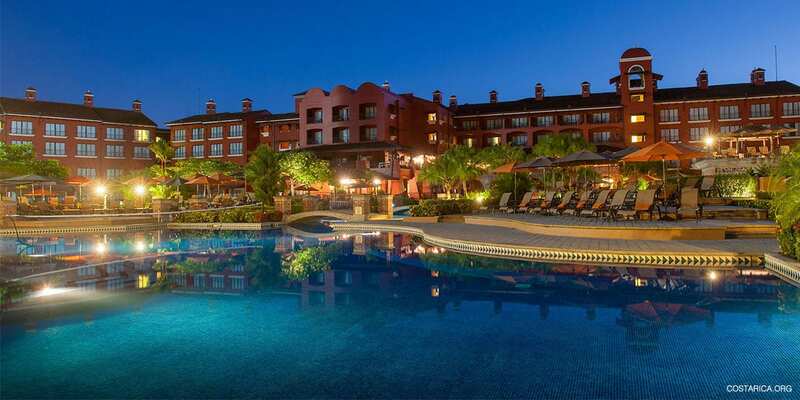 Hotels like Westin Playa Conchal are famous for its luxury golf courses. If you are looking for adventure a bit further away, you can also have a day trip arranged to visit other parts of the country from your beach hotel. Inclusive vacations are so called for a reason, everything you might want to do is included. Anything for the guests! All-Inclusive Costa Rica Vacation Packages – Worry Free! My Costa Rica can take your all inclusive vacation one step further. We have created custom all inclusive packages to meet your exact needs. Just tell us how you are looking to spend your time Costa Rica, and we’ll make sure your travel dreams come to life. In fact, we have many years delivering successful Costa Rica unique all-inclusive packages for the perfect vacation custom designed for you! Maybe you only want relaxing activities? Or perhaps you’re craving some adventure? Or, maybe you want a combination! Not only will we pick the perfect all inclusive hotel for you, but we can make your reservation for you and even provide airport transfers to and from the resort. Costa Rica all inclusive vacations will leave you pampered, and relaxed. Your Costa Rica vacation is made easier with these all-inclusive packages perfect for families and couples alike! For some ideas on Costa Rica all inclusive vacations packages, feel free to review some of our favorites below. By all means, treat yourself to an all inclusive vacation in paradise. Wellness, Yoga & Surf Vacation in Paradise!